The iconic philanthropist was born in Israel and has a long history of activism in support of the Jewish state’s well-being and vitality in all arenas – from economic to health and education. Elie Hirschfeld was recently named to a critical position on the National Campaign Advisory Board of Israel Bonds Corporation. Among the influential and highly placed state officials, he met with were Minister of Finance Mosh Kahlon, to develop innovative concepts in affordable housing in Israel. “Providing practical homes for people in the ever-evolving Jewish homeland is a critical concern, and I’m pleased to have the opportunity to lend my background and expertise to help provide the best solutions possible,” Elie Hirschfeld said of the meeting. 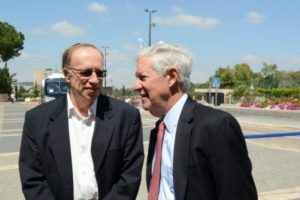 Mr. Hirschfeld also shared his insights and expertise in real estate, education and development to meetings with such other top Israeli officials as key Knesset member and Minister of Tourism, Yariv Levin; the Hon. Gideon Sa’ar, Former Minister of Education and Interior; President and CEO of the Development Corporation for Israel/Israel Bonds, Israel Maimon.